Are you a frequent flyer? Do you find yourself away from home more often than not? Well, if you are one of the thousands of people who are affected by jet-lag or the inability to fall asleep when away from home, yawn a sigh of relief because the Travel Sleep Sound Therapy System is here to save your day! Whether you are traveling for business or pleasure, getting a restful night’s sleep means you’ll have plenty of energy for whatever tomorrow brings. The Travel Sleep Sound Therapy System is the perfect travel companion. 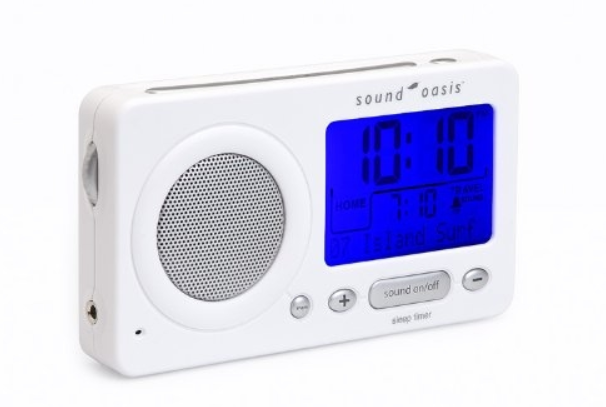 Designed by Dr. Jeffrey Thompson to help combat barriers to quality sleep and jet-lag while traveling, it combines soothing nature sounds with a full-featured alarm clock. There are 19 beautifully recorded nature sounds to choose from including ocean surf, white noise, thunderstorm, bonfire, wind, song birds and cooling fan- just to name a few. The exclusive jet-lag reduction sound combines nature and rhythmic sounds specifically designed to reduce the effects of jet-lag- and it really works! Another unique feature is the voice memo aspect that allows you or a loved one record a personal message to wake up help start your day off on the right foot. So, no matter where you go, you’ll never be far from home. The Travel Sleep Sound Therapy System can help you get a better night’s rest at home and on the road. Block out annoying hotel noises and create a soothing sleep environment at home with this amazing sleep system. Also included with your purchase is a time zone map and a travel pouch for safe keeping. Save over $20 on the Travel Sleep Sound Therapy System when you purchase it at www.snoremart.com!